Still low CPU. In fact the only thing form it that does anything is the process that runs the Flash Player. And it has the CMD+Numeric key combo to jump between tabs. Well Opera does rock and it works really well. But it's buggy and not supported. I had issues using Basecamp and the support told me that they do not support Opera. And post editing on Blogger has quirks. And some more little annoyances. So I tried to go bleeding edge and use WebKit nightly. It was mad and in no way usable. I know, I know, it's not supposed to be. So I still needed a WebKit based browser. OK, I'll say it! I'm running Google Chrome! ARE YOU HAPPY?!!! The low profile it keeps is actually scary. Also it uses a lot of proceses. Looks like each tab has it's own process. But still the sum of CPU usage is very low. Safari/WebKit was using empty 12-15 % on par with the FFat boy. Chrome is below 7. All those surveillance data computing and sending routines must be really well optimized. Good job! And yes, I installed Flash Block. I too am weary of using my CPU cycles to run banner ads that I don't even notice. Safari hogs my CPU when it needs to do AJAX calls. Like Netvibes and the likes. It really feels like it does most of them asyncroneously. Strike 2 Safari! Urrrrr OUT! Simply because Firefox failed me last night. And you can actually jump to a tab number with relative grace. Read on. But last evening these two babies were keeping my CPU temp at 70C constantly. The dev instance was hogging about 25% CPU and the other one was going nuts and jumping from 30 to 90. Too many tabs. All needed. Usually I'm fair when it comes to my processes and I tolerate those that put a high load on my CPU if they're hard workers. But the Firefox surfing instance was going nuts even if hidden or minimized. So I used the Force. Force Quit that is. "For my ally is the Force. And a powerful ally it is." Fired up Safari. Latest 4.0.1 update. I used it before on occasion so the killer "Top Sites" was long gone. Hmm, Home Page was set to blank. Niiiceeee. Oooo, a Develop Menu item. Aaaaaaa. Well I won't use it for dev. Had to in Jan this year. Doesn't really work reliable. It's cute though. Not wrong. Just not right. Deleted all bookmarks. I don't get it. Aren't bookmarks pages that I was supposed to mark so I find them later? Well surely Apple already knows what I'm going to mark. Amazon, Weather, all my favs. Must havez for sure. Firefox bookmarks export, Safari import, little arranging, done. And now let me get to the best part. You see, my must have Firefox-for-web-browsing feature is the Command + n combo to jump to tab number, 0 being for the last tab. In Safari that opens the bookmark number in the current tab. On a scale from 1 to 10 for annoyance that gets 100 points. How stupid can Apple be to think that I have some bookmarks that are both so important to need an open combo _and_ so useless that I will close them constantly instead of leaving them open for later re-checking. I don't get it. Am I the only one who leaves the Gmail window open instead of opening it using a karate combo, checking the latest emails and immediately closing it using another karate combo even more deadly than the first one. I can only imagine the Apple employees opening and closing tabs all day long at the speed of light. Gimme a break! I hope you are already using Quicksilver. If not stop here and go get it. WHAT ARE YOU THINKING?! So how can you jump between tabs in Safari like in Firefox using a 2 keys combo? press Tab and in the "Action" start typing "run". 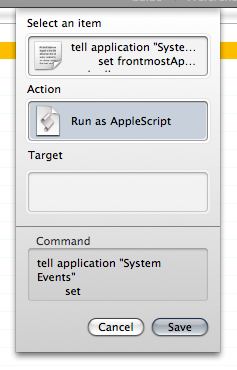 It should end up saying "Run as Apple Script". Save it. Double-Click on the Trigger column of your newly created item and in the right panel give it a nice name and Edit the Hot Key to "Command + 1"
In the "Scope" tab select "Enable in selected applications:" and in the lower box type "Safari" and hit Enter. Not sure if it does something major so if anyone can clear this up please drop a comment. Done. Now when you press "Command + 1" and Safari is in front you will be prompted with a list from 1 to 9 and 0. When you see the list press the tab number of your desire and hit Enter. You can hit ESC to get rid of the dialog. It should look something like this. I wanted to put the pic directly here but Safari's the only one who messes up the post source and doesn't show it properly. Strike ONE Safari! So far Safari rocks. There is a considerable amount of features that I'm missing but as I get into using Safari more I'm sure some good alternatives will pop up. Yeah, it has a pop up blocker too! Hmmm, should I disable it then? give a linux laptop. change the world.